Not long ago I asked my mum what she thought my deepest fears were in an attempt to, perhaps, discover something I wasn’t aware of yet. She started talking about the past and replied, “You were not afraid of anything”. “Neither the darkness nor scary movies. You were always trained to jump into the water, no matter how high you thought it was”. Oh god, I want to be that girl again! As you probably know, fear is a really important emotion; it keeps you safe from danger. On the one hand, it is fascinating how we can develop unfounded fears, stopping us from doing the things we really want, blocking us from personal growth and moving us away from success. If you have experienced anxiety, you would have also experienced the tendency to avoid the source of your fears. It feels so massive that you prefer just to turn your back away from it and do something else but going through that. The problem with doing this is that you are training your brain to believe those things are actually dangerous and something you need to run away from next time. If you leave or run from the threat, physically or mentally, you won’t get to experience the best bit. The best part is the one in which those nerves, that anxiety, just calms itself down. Even better, the moment after, when you feel really proud of yourself for getting out there and fighting for your dreams! Rest assure that if you stick around for long enough with your fear, the symptoms will subside after a few minutes. The body can’t just hold that tension for more than a few minutes. It understands that it is not worth the energy. What remains after, is just helping you to perform better. However, I am not going to ask you to jump into the sea, no matter how deep you think it is. I want to share with you a different way to confront and hack your fears with ease. This is something I practice with those unfounded fears I have learned and have proven to be extremely helpful. This cognitive-behavioural technique is used in many psychological treatments; anxiety and phobias are some of them. Highly useful in facing any type of fears that you may feel overwhelmed by at any point in your career and life. It consists of deconstructing your fears, breaking them down into a series of manageable steps. This way it becomes a bit easier to achieve your goal of overcoming it. Think about it as if you would break down a project into different sections and tasks. Start by thinking about a situation that is likely to make you unbearably nervous or anxious. Let’s say you want to invest in a career change to do something that you really love. Every time you think about what it entails you get so anxious that you prefer not to give it more attention. Choose one of those fears and think about the extremes. For example, if telling your current employer you are thinking of leaving is the one you want to focus on because it creates anxiety, this would be rated as a 10. It will become your ultimate objective. Then, think about a related situation or activity to do with this specific focus. One which makes you feel confident and does not produce as much discomfort. For example asking a friend what they would do in your position. Rating this as 1 or 2 depending on the anxiety that it produces. You must find at least 10 different situations that would progressively get you closer to your #10 Talking to your boss about leaving. #1 Asking a friend what they would do in my position. This is how your ladder could look like. It can have as many steps as you wish. The only condition is that you organise it following your rating, from what produces less anxiety (1) to what scares you the most (10). It is Ok if you have various situations or activities in the same range of rating. It is important to start with those situations that give you at least some anxiety. The key here resides on sitting with those feelings for long enough to experience the process. This is what will give you the confidence to get closer to your target. Once you get on with the activity, you need to hang on in there. While in the situation try not to distract yourself, you need to be fully present and embracing whatever you are feeling. It is the only way to move your way up the ladder and overcome your biggest fears confidently, step by step. Some people know they are fearful of “X” and they are able to just jump into it. Awesome! Perhaps, you are one of them and in some areas of your life you don’t need to be so strategic. However, there might be other areas where you feel much more insecure and whatever the reason is, you feel too overwhelmed to take action. Test the ladder there and see what happens. Don’t let the fear freeze or make you run away anymore! 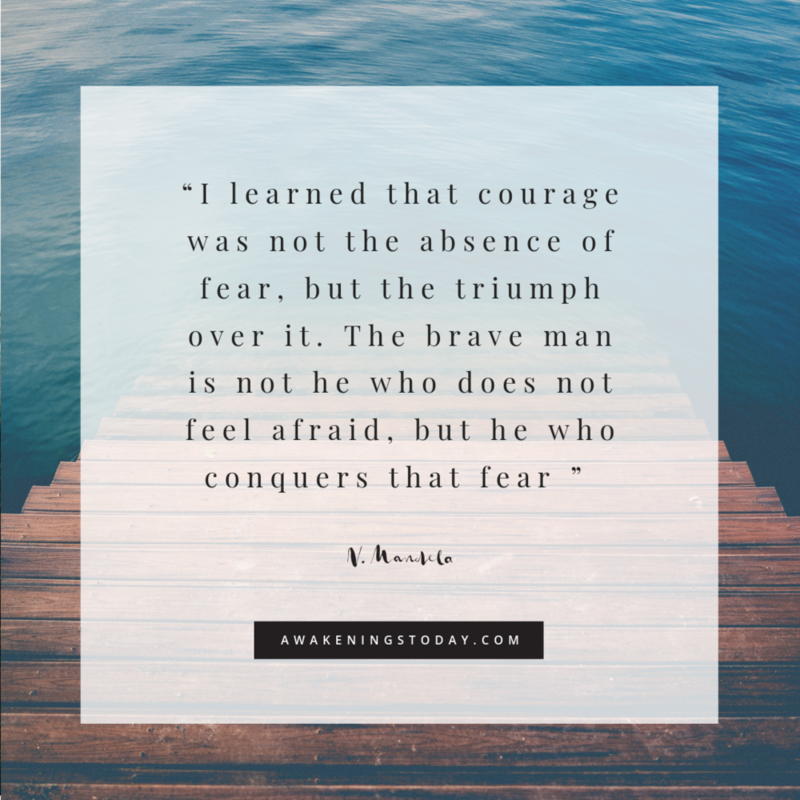 I would love to know more about you experience(s) with this or any other techniques you may have used to overcome fears. Share it in the comments or head towards The Confidence Hub where we have a bunch of beautiful humans fighting to accomplish their dreams and grow with confidence.